Why Securing Your Website May Be The Most Important Thing You Do: In one corner you have Security. To be secure. To be safe. Reliable. Dependable. In the other corner you have Unsecure, and Insecure, and Not Secure. All of which mean one thing — You’re in danger. Or don’t. Actually don’t. Stay here because I’ve already done it for you. Around the number seven slot is a story from 2014 about how the majority of Americans don’t feel safe online. Providing Pew Research data that 80% of Americans don’t feel safe online. Why? Because of guy named Ed. Since then--I won’t link to all of these because I think the majority of this page is now blue and/or underlined--we’ve sustained major breaches on our Facebook pages, emails, and bank accounts. It took him less than 120 seconds to uncover a massive compromise of the most personal of information. If this isn’t enough glorious goodness for you, good luck with your SEO. Google will punish (It’s their world isn’t it?) 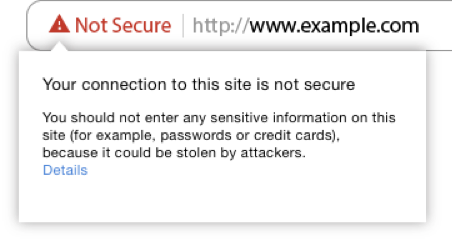 for not possessing said SSL Certificate when calculating your chances of showing up on a query. This is where Jon Gicewicz earns his money. Every year it’s up to him to ensure his web design clients obtain or renew their certificate. How good is he at not only doing this but by keeping his clients sites secure? Full disclosure, I had to needle Jon a bit. Curiosity got the better of me and I desperately needed to know what happened. He refused. He didn’t want to talk about it. But I’m quite persistent. After my OCD/Gestapo like inquisition--he finally confessed it was the sites proprietors who were ultimately culpable. When a site is compromised, the front-end users aren’t reluctant to ever do business with your company again. They’re typically petrified. It can happen that quick. It can happen that easily. More importantly though--it will happen that quick. And it will happen that easily. In the world of dieting, it seems as if we can gain five pounds overnight but it takes us a month to lose it. Right? In the world of web, mobile and social media sites—It can take months, years even to gain followers, subscribers, customers. Then, in the flash of one, just one security breach, which happen daily, they’re all gone. Norton Security--you may have heard of them--shows in this article, the average cost to a company in the United States who suffers a data breach, as of 2018 was $7.91 million. Average length of time it takes companies to discover they were attacked, 196 days. People who own “brick and mortars” (Business with a physical location) will invest in cameras, alarm systems, cages, expensive locks, dogs and of course, guns. All of which to protect them from a potential intruder. But according to this report by the Federal Bureau of Investigation, property crime is on a steady decline. Yet, more than half of the sites Jon Gicewicz investigates on his initial onboarding consultation own some flavor of security breach or are in need of a necessary fix. Not all web designers do a thorough vetting of a new clients site. Hell, some don’t even check on their existing ones too. And here is the real kick in the junk, some web designers may even see a security breach as an opportunity to upsell! And in the other corner, web designers like J.E.G Design are proud of their impeccable record in data security for their clientele. Do yourself a favor, contact J.E.G Design for a free estimate on what it will take to secure your site. People invest thousands to protect themselves from the criminals they may potentially see. All the while spending next to nothing to secure themselves from the criminals they are blind to. I mean, you’ve obviously got enough to feel unsecure, insecure, and not secure about--Contact J.E.G Design today and let’s make this a fair fight.